The previous post generated a number of responses, mostly positive, but there were a couple of negative remarks, one of which I thought I should address. One claim was that this new way of examining the imagery (which was misleadingly described as “enhancement”) confuses the issue and makes the images harder to assess. In reality, the processes used in the previous post and in this one are for the most part not “enhancements.” While I have used various image enhancement tools in the past, most of these treatments use unaltered original images to create composites that make it possible to separate figure from ground and parts of the target from artifacts. It’s not a perfect method, but it’s an illuminating one, even with low resolution images. It requires no special forensic expertise. As should become clear from this post, it can also be useful for estimating size. The images examined in this post were all captured December 7, 2014 on a Reconyx Trail cam that was showing its age. They were previously discussed here, here, and here. As in the previous post, I’ve used Luminar to create the composites and apply various effects for this deeper dive. As always, views can be had by clicking on the images themselves; mousing over the images will reveal captions in most instances, and I have added versions with arrows to help orient you. I strongly encourage you to examine the images closely. I’ve reposted the original captures in tiled mosaic form below; I’ll follow that with some composites and comparisons among the images. I think the results are helpful if not quite as revelatory as the ones in the last round. A very prominent American birder tweeted that one of the images below shows a Blue Jay (9.8-11.8″) and characterized the suggestion that it might be an ivorybill as “crazy”. (This is the capture I think is likeliest for ivorybill in this group.) I think his knee-jerk suggestion is absurd, as this approach to reviewing the images should make more apparent. Rotated, resized image of Imperial Woodpecker in flight. The bird is angled downward and slightly away from the camera obscuring the bill and foreshortening the profile. An automated motion blur reduction feature has been applied to the image of the putative ivorybill. The next image shows the difference between the foregoing frame and one captured approximately 40 minutes later. The bird to the left of the snag is clearly closer to the camera (which was approximately 85′ from the target snag), between it and the snag. The composite strengthens the impression that the suspected ivorybill is behind the tree and the foliage behind it, since at least some leaves appear to be between bird and camera. Frank estimated the foliage as being 15′ more distant. In the earlier discussion, several Pileated Woodpecker captures, including the one below, were used for comparison. These captures were taken from a slightly different position, but that’s irrelevant to the issue of size relative to the reference object, the jug handle-shaped stub. Composite of three captures, showing suspected ivorybill and Red-headed Woodpecker at right and possible ivorybill at upper left. A different but related method of image processing is helpful for understanding the position of the bird relative to the snag and also suggests that another capture in the series is at least size-appropriate for ivorybill; the tuck and the long, pointed shape of the wings are also intriguing. The first composite shows the unknown bird and the Red-headed Woodpecker. (Note what seems to be a wing, species unknowable, protruding from behind the snag; it appears in the Red-headed frame and no others and had gone unnoticed until now. On looking again, this could also be a squirrel’s tail, albeit unusually positioned.) The second is an overlay of the suspected ivorybill capture and the unknown bird processed using Luminar’s “Color Burn” feature; the two birds appear to be approximately the same size and in the same plane. I’ve added a shot of a Pileated Woodpecker in flight, with wings in a similar position, for comparison. Another capture from the morning of December 7 has always interested us. The underwing pattern and shape are suggestive of ivorybill and reminiscent of one of the Singer Tract photographs. But questions about size have lingered. Comparing this image with two others from the same deployment that show Red-headed Woodpeckers may be helpful, and it has pushed me toward favoring Ivory-billed Woodpecker for this capture as well. Composite showing Red-headed Woodpecker at Right and Possible Ivory-billed Woodpecker at Upper Left. Also note apparent long wing behind the snag, directly above the confirmed RHWO. This feature is absent in other frames and went unnoticed until this review. Composite showing difference between captures Red-headed and apparent wing at right and possible ivorybill at upper left. This capture seems more ambiguous to me, but a few factors are more consistent with Ivory-billed Woodpecker than Red-headed Woodpecker. Both Red-headed Woodpeckers, one captured on the same morning under similar lighting conditions, appear to be closer to the camera than the possible ivorybill. My efforts at measuring wingspan were crude, but the suspected ivorybill seems to have a slightly greater wingspan, despite the upturned angle of the wings and apparent greater distance from the camera. This would tend to exclude Red-headed. The comparison is also useful insofar as it shows that the wing and body shape of the possible ivorybill are not similar to the Red-headed Woodpeckers captured during this deployment. While Red-headed wing and body shapes can resemble ivorybill at certain angles and under certain lighting conditions, as Bill Pulliam documented years ago, the tail in this image looks too long relative to the body, and the wings look very narrow, at an angle that I don’t think would create an illusion of elongation. As always, I’m open to correction, and my interpretations are provisional. Intelligent and informed comments are welcome. 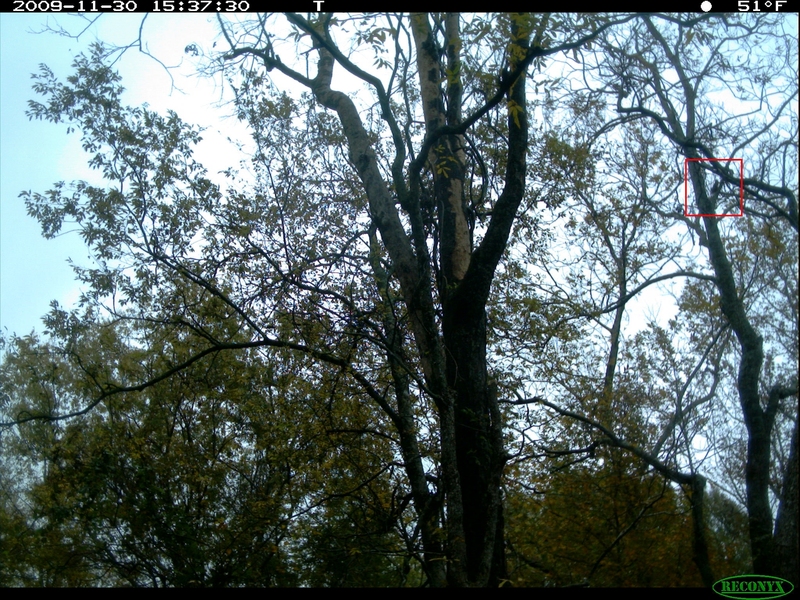 If you haven’t done so already, please read Trail Cam Photos Revisited for a more comprehensive discussion of the image that’s central to this post (including an explanation of our conclusion that the mystery bird is larger than a Pileated Woodpecker). At the time of writing, I didn’t envision doing a follow-up, but the nagging sense that the Rhein Imperial Woodpecker film might be even more relevant than I thought initially led me to go through the film again and pull an additional frame that showed the body profile, with neck extended, more fully and accurately. While I added an update to the original post that included a brightened composite for comparison, there’s a bit more to say. We’re aware that many (perhaps most) in the scientific and birding communities will accept nothing less than a clear, high quality photograph (or series of photographs) or video. We’re also aware that many people will dismiss any post-processing whatsoever, even when intermediate steps are shown and the processing is relatively limited (in this case only involving the removal of motion blur). I must add, as should be evident from the images in this post, my skills with photographic post-processing tools are very limited. (Patricia Johnson, my wife, had to talk me through the rotation of the images in Photoshop.) Nevertheless, we think comparing the de-blurred mystery bird with frames from the Rhein film showing an Imperial Woodpecker in flight with similarly positioned wings makes a compelling case that our mystery bird is indeed an Ivory-billed Woodpecker. Our choice of location for the game cam deployment was not random. As with this image (from our old search area), which was obtained a week after a sighting in the same location, the camera was deployed in an area where we’d had recent possible contacts – multiple double knocks (scroll to the end of the trip report) heard within a few hundred yards before and during the deployment, about a week before the image was captured. We also recorded an apparent double knock on the day we retrieved the cards. Thus, in both instances there was a close temporal association between a putative encounter and obtaining (at worst) a strongly suggestive trail cam capture. But I digress . . .
To return to the Imperial Woodpecker, these two screen captures are the most salient. Screen capture of Imperial Woodpecker in flight, shortly after take-off, at a different angle, but with similar wing position. Screen capture of Imperial Woodpecker in flight. I was unable to find frames in the film that replicate the angle from which the mystery bird was shot. In the first of these two frames, the bird is flying downward and is angled slightly away from the camera, obscuring the bill and foreshortening the neck and tail. The second is a ventral view from behind, and the bird is angled downward. Our mystery bird is ascending and is seen in profile. Nonetheless, the similarities in both the extent of white on the wing and physical structure are striking. This becomes even more apparent when the Imperial frames are rotated and sized to match the mystery bird. Be sure to click on the images to see the full sized versions. Rotated, resized image of Imperial Woodpecker in flight. In the original, the bird is angled downward and slightly away from the camera obscuring the bill and foreshortening the profile. Imperial Woodpecker in flight. Rotated and re-sized for comparison with mystery bird. Although this is a more ventral and posterior view, the similarities in structure are dramatic. Frank recently found a series of images from our trail cam deployment discussed here. These photographs, taken with a second camera, are of very poor quality, but they show what is clearly a Pileated Woodpecker on the target snag. Frank’s discovery led us to re-examine some of the images discussed in Frank’s post and elsewhere on the site because they gave us a reference object to assess the size of the birds in two other low quality trail cam photos. Based on this reference object and informed by outside evaluations, we’re confident that the “mystery bird” discussed in this post is in fact a Red-headed Woodpecker. (We still concur with the author’s analysis of the other image discussed in the post.) The bird is clearly behind the tree but not very far from it, and it is simply too small to be anything else. Despite my initial interest in this photo, I had been leaning toward Red-headed based on feedback from a number of people and on the length of the tail. I have always thought that this was the most intriguing image in the series, although some reviewers have disagreed. I’ve also always believed that the bird was behind the snag and in front of the somewhat more distant small branches, which would mean it’s large. Frank, who has by now reviewed perhaps 1 million trail cam images, has always agreed with this interpretation. Frank’s discovery of the Pileated sequence led me to re-examine this photograph and dig a little deeper. One reviewer suggested that motion blur made it impossible to make any judgments about size or distance from the camera. In response, I did a bit of research and found Focus Magic, a forensic program designed to reduce or eliminate motion blur. Image processed with Focus Magic. Setting for a 35 degree angle and a blur distance setting of 13 out of 20. The object was selected using the lasso tool in Photoshop, making it possible to de-blur the moving bird without affecting the rest of the image. I shared this processed image with Louis Shackleton, a professional photographer friend who has a background in ornithology. I also sent Louis one of the Pileated images and these two other trail cam photos that were taken within an hour and ten minutes of the first, on December 7, 2014. Frank and I interpret the photograph as follows. It shows a long-necked, long-tailed, slender-bodied bird that is somewhat larger than a Pileated Woodpecker flying upwards at about a 35 degree angle. There is white on the trailing edge of the wing, although it’s unclear whether this white is on the underside of the left wing, the upper side of the right wing, or both. We do not believe this white to be an artifact, since it appears faintly in the unaltered image; it becomes more fully resolved when the blur is eliminated; it is still present even at a blur distance of 20, the highest Focus Magic setting, when image clarity breaks down significantly. A couple of considerably more ambiguous features are also intriguing. The bird appears to have a fairly distinct and sizeable bill, and in the Focus Magic iteration in which the white is most clearly defined (blur distance 13), there’s a hint of red on the head, although this could easily be an artifact. While the William Rhein film of an Imperial Woodpecker in flight was shot at a different angle, we think the profile and structure of the IMWO in that footage strongly resemble our mystery bird. Edited to add: To facilitate comparing our mystery bird with the Imperial Woodpecker in the frame shown above, I’ve created a composite image using the 13-35 de-blurred image, which I’ve also brightened. In addition to flying downward, the Imperial is angled slightly away from the camera, foreshortening the neck and obscuring the bill. It has been observed that there’s nothing to prove our mystery bird is a woodpecker, and that’s a fair point; however, the size, shape, and apparent white on the back of the wing are all consistent with Ivory-billed Woodpecker. We realize that this is far from conclusive but can think of few alternative interpretations, all of which are problematic. Cornell has an enhanced extract from the 1956 William L. Rhein Imperial Woodpecker film. The extract was included in the supporting materials for the Auk paper that discusses the film. I had overlooked it until now and suspect that others may have missed it. In this clip, the bird can be seen scaling bark from what looks like a living pine. While the quality of the film is poor, even with the enhancement, the upper section of the scaled area shows signs of earlier excavation. The bark chips removed in this segment appear to be fairly small, especially when compared to some of the larger one’s we’ve found, but the speed and efficiency with which the bird removed the bark, as well as the way in which she did so, may be relevant to the scaling we’re seeing in Lousiaiana.